As a child I was a very plain eater, even by the standards of a 1980s suburban Anglo-Canadian family of assorted British ancestry. An unexpected and quite literally remarkable appreciation for olives aside, I ate rather plainly. 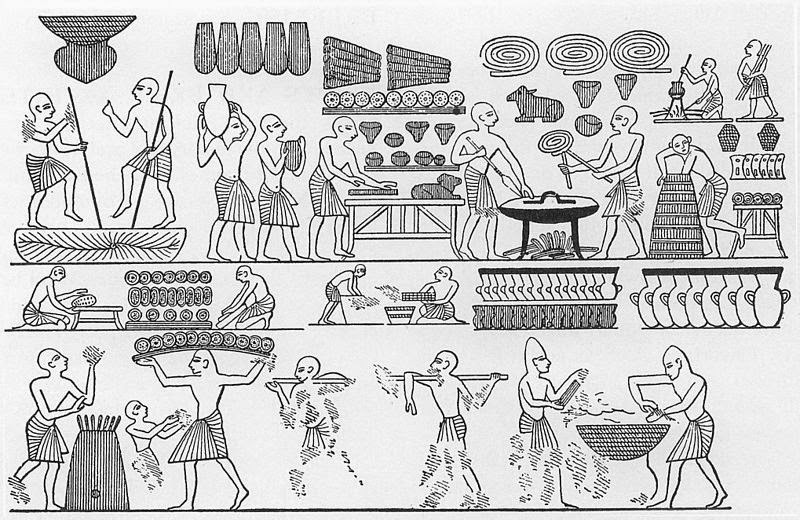 Meats, potatoes, and vegetables , all served as plainly as possible. I'd even usually my veggies raw, that is if I couldn’t weasel my way out of eating them at all. Sure, sometimes were ordered a pizza on Friday night, and even occasionally scored some Canadianized/Americanized Chinese food on special occasions, but Toronto was not yet a global and globally respectable food city. The meat counter at the local supermarket stocked steak, pork chops and chicken breast. What happened to the other cuts, I’ll never know. Anything other than frozen sausages required a special trip to the Italian deli. My grandparents even remember a time when local butchers would simply give away chicken wings and pork ribs; nobody save poor immigrants knew how to cook them. Not that we did much better with the mainstream cuts... as child I never quite understood why red meat was called red meat. Wasn’t it brown by the time Grandma served it? Given all of the above, it probably should have seemed strange to me that one of my favorite meals was Grandma’s chicken curry: an aromatic, flavourful dish that had very little in common with… well, everything else we ate. These past few years, as I have immersed myself in the history of British India, I have come to realize that such a dish must have an interesting story behind it. Furthemore as I gradually teach myself how to ‘cook’ meals instead of ‘heat’ them, and explore international cuisines, I have realized that Grandma's curry is actually a lot more Canadian and a lot less Indian than I had assumed as a child. Remove the bacon and save it for later. 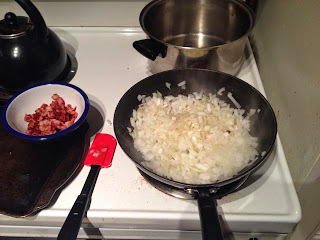 In the bacon grease, fry two finely chopped onions and a couple cups of chopped celery. Add to the mixture 2/3 of a cup of apple sauce, 4 tsp of sugar and 4 tsp of lemon juice. 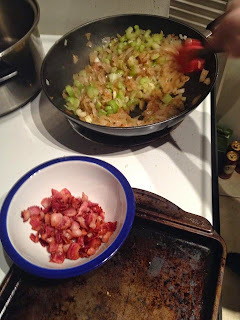 Add the chopped up chicken and crumbled bacon to the mixture. Stir it all up (this is where you add more curry flavor if it isn’t strong enough) and let it simmer for at least half an hour or so. Serve over rice, with naan, or potatoes. This dish is killer served over French fries. 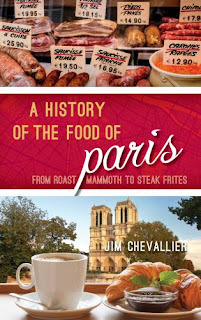 While you are eating the dish you can read about its historical relevance. 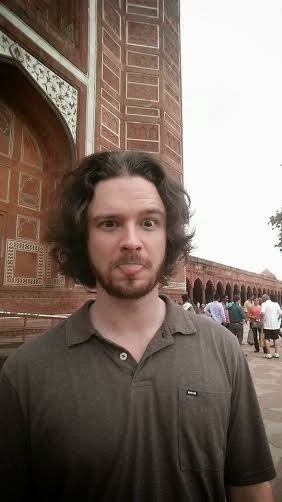 My grandfather was born in the 1930s on an army base in British controlled India, in the part that is now Pakistan. In my younger days, when I thought critically about this dish at all, I assumed its origins must have something to do with that little bit of family history. Perhaps my great- grandmother had brought it back home with her to Scotland? She wouldn't have been the only army wife to have engaged in culinary imperialism. Curry is considered Britain's national dish for a reason. But it is obvious from the recipe that this curry dish has very little in common with its authentic South Asian counterparts. The use of milk rather than coconut milk or yogurt is odd, and I've never come across another South Asian dish calling for apple sauce. But these are minor idiosyncrasies that might be explained as modifications to bring the recipe in line with locally available ingredients. It is hard to imagine, however, the circumstances under which the wife of a Scottish soldier would have learned how to cook a dish involving pork and ‘curry powder’ from one of the locals in 1930s Quetta. Great-grandma apparently wasn't much of a cook anyway. 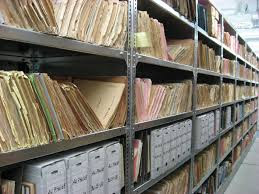 The best part about doing recent family history is that you can just call up Grandma and ask. It turns out that her curry recipe originally came from The Laura Secord Canadian Cook Book, first published in 1966. The Cookbook was a creation of the Canadian Home Economics Association, a nationalist cookbook designed to celebrate Canada's 1967 centennial. The book was sold by the Laura Secord Chocolates Company, themselves in the game of harnessing nationalist feelings to sell chocolates. The hope was that Laura Secord shoppers would notice the book while shopping for gifts, and gift it to interested friends and relatives. It seems to have been a success: the book, now in its second edition, is still in print. The recipes contained within are all, unsurprisingly, as Canadian as possible. The Laura Secord Canadian Cookbook was unashamedly nationalist. It aimed to demonstrate that there was indeed a 'Canadian' cuisine, and did so by assembling dishes made using local ingredients, a number of regional specialties, and the odd dish drawn from the cuisine of the immigrant communities that comprised the bulk of Canada's population. Ukranian style cabbage rolls made the cut, for example, as a Saskatchewan staple. But our curry is still no Indian dish. The Canadian Government only scrapped racist ethnicity based immigration quotas in 1967, and large-scale South Asian immigration to Canada didn't began until the 1970s. Our curry, it seems, was probably included as a 'British' dish. Indian inspired curry dishes had been available in Britain since the nineteenth century, and were widely known by the middle of the twentieth. In the 1960s, a majority of Anglo-Canadians were still of British stock, and Britain remained one of the major sources of immigrants to Canada in the decades after the Second World War. My grandfather was one of them. 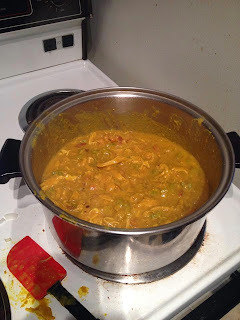 I've had no luck figuring out whether or not the recipe for this curry was based on a specific British curry recipe, or just a new creation loosely inspired by British curries, but based on the sorts of ingredients and cooking methods the authors of the Laura Secord Canadian Cookbook thought the average Canadian housewife could access. Either way, this dish remains an interesting example of the ways that recipes, ideas and styles migrate between cultures. It is now possible to get authentic Indian food all across Canada, and my days of bland, picky, meat and potatoes eating are behind me. For all my exploration, I've never eaten any other curry quite like this one. It remains, however, both one of my favorite dishes, and the first thing that pops to my mind when I think 'curry.' Maybe this is a Canadian dish after all.